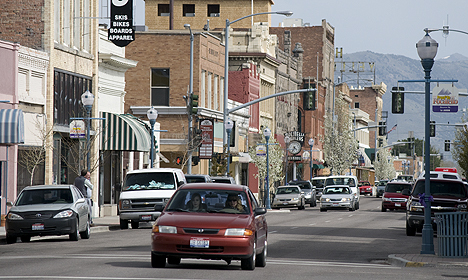 Pocatello, Idaho, positioned at the junction of Highways 15 and 86, bills itself as a gateway to the Northwest. Most travelers en route to Washington state from Salt Lake City, Utah travel through this junction, which also serves travelers heading north to Missoula, Montana. Pocatello derives its name from Chief Pocatello of the Shoshone Tribe, who granted access to the railroad in the late 1800s. The area is rich in historical landmarks, as it was also a prominent junction for travelers during the gold rush. Historical artifacts and displays are available at the Fort Hall Replica, the Bannock County Historical Museum (both located in Ross Park), the Shoshone-Bannock Tribal Museum and the Idaho Museum of Natural History. Pocatello also marks the crossroads for two important pioneer trails: the Oregon Trail and the California Trail, which both helped to carry emigrants to the West Coast during the mid-1800s. Nearby Sheep Rock and Hooper Springs, which lie east near Soda Springs, memorialize these pioneers with displays and a 55-mile recreational trail. Pocatello is rodeo country, with events that take place in and around Pocatello throughout the summer and fall. National finals kick off the season in March, followed by local competitions by Idaho State University, the Shoshone-Bannock Indian Tribes and others. Seasonal activities in the Pocatello area includes alpine and Nordic skiing on groomed trails, snowmobiling and walking the Portneuf Greenway trails along Pocatello's scenic Portneuf River. Ross Park also houses Pocatello Zoo, dedicated to studying and preserving native North American animals, and the Ross Park Aquatic Center with multiple aquatic facilities designed for summer recreation.